Dome Village is home to a half-dozen people living at Maitreya Ecovillage in Eugene, Oregon who share a one-bedroom apartment while sleeping in their personal bedrooms made of cardboard and old political signs that the original residents of Dome Village built a decade ago. Their monthly expenses and ecological footprint are a small fraction of their neighbors’, and they are happily living with their friends, yet their lifestyle is illegal. In 2009 the ecovillage received a notice from the city code enforcement department that we had one week to remove their bedrooms or face a $400 per day fine for illegal camping. Five years later elected officials were on hand for the ribbon cutting of “Opportunity Village,” a city-approved collection of small bedrooms and shared common kitchen to provide temporary shelter to homeless people, and Dome Village was still thriving at Maitreya. What led to this happy outcome? The short answer is that a healthy balance of strategies and a committed community were able to create a cultural shift that supported the emergence of creative responses to some of the challenges of our times, including climate change, social isolation, and a lack of affordable housing. Just as a healthy garden contains a variety of plants rather than a monoculture, a healthy activist community is populated by people playing a variety of roles. There were visionary leaders, early adopters, social organizers, advocates, inventive builders, resource contributors, government supporters, street occupiers, journalists, academics, and many others who played a role in this shift of culture. Here I tell the part of this story that I personally witnessed, aware that this is just a small part of a much larger tale. There are many people not mentioned here who have contributed to the creation of these villages, and the emergence of Dome Village and Opportunity Village is part of an unfolding process that will likely eventually lead to legalizing and creating many more affordable, communal, and ecological places to live. One thing that inspired me when I moved to Maitreya in 2002 was the nearby Dharmalaya Center, a beautiful strawbale building that was being built in the backyard of a family’s house with the help of many community volunteers. Once built, the center hosted yoga classes, permaculture courses, and neighborhood gatherings. Frustratingly, a few years later the folks at Dharmalaya received a notice that this center operated in violation of city land use codes. A six hour public hearing took place in which almost 100 people spoke on behalf of Dharmalaya, with no one speaking against them. I noticed that the officials representing the government in this hearing seemed to be sinking into their chairs, not happy to be spoiling the fun of so many enthusiastic supporters. The outcome of this hearing was that Dharmalaya was allowed to continue operating their center with some restrictions. Possibly as a result of this legal encounter, Dome Village was later supported by city code enforcers, an unanticipated ripple I will describe in a moment. Upon moving to Eugene I was also inspired by my new neighbor, Finn Po, who built the first dome at Maitreya. He voiced his dream of people living lives of voluntary simplicity close to the earth while sharing resources, and talked about the joy of living “house free” with low financial overhead and plenty of friends nearby. He slept in the dome he had built for $18, preferring this cozy nest to the indoor bedroom that he used for an office. 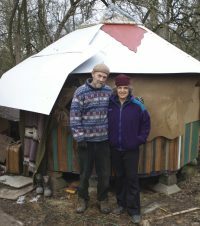 Early adopters asked Finn to teach them how to build their own domes, and Finn invited them to share his kitchen and bathroom while they built and then lived in their dwellings. Within a few years there were a half-dozen tiny bedrooms clustered in a plum orchard near his rented apartment. At the same time, I worked with a Landscape Architecture class at the University of Oregon to design a model village for a three-acre property in Eugene, and these beautiful designs were displayed for a couple of months in the lobby of the city building department. I submitted a proposal for “ecovillage zoning” to the city that would make it legal to build this village. While the proposal was not approved and the village was not built, these ideas and images for creating a simple, ecological, and beautiful village percolated in the minds of those who passed through the building department and those who read the proposal. Amidst all the hopeful developments, the moment arrived when Robert Bolman, who owned the land where Dome Village was located, received a letter from the city requiring him to dismantle Dome Village within a week. A neighbor had become disgruntled by noise emanating from our chicken coop, and called the city to complain about that and our “illegal camping.” Rob and I went downtown to talk with a code enforcer, where we reported that we had already moved the chickens to a location farther away from neighbors. Regarding the citation of “illegal camping,” we acknowledged the important role the code enforcer played in making sure people were not exploited and were safe in their housing, and described how we manifested these values at Dome Village. We said we were creating a demonstration model of how people could make the whole planet safer by decreasing our ecological footprint through shared simple living. We talked about the importance of pilot experiments for responding to a possible influx of climate refugees to the Pacific Northwest. We appreciated her for doing her part from within the government to protect people’s lives, and said we were consciously operating outside the law with similar goals. We handed her a copy of the article I had written about Dome Village. When we requested a hearing even though we knew that Dome Village was illegal, her eyes grew big. In this moment, I realized the lasting impression that the Dharmalaya hearing had likely made on the city code enforcers. Within 24 hours of our meeting they sent out an inspector who simply asked us to pick up the fallen plums on the ground around the domes. While the domes were not declared officially legal, it became clear that they could remain, which encouraged friends throughout the city to build dome bedrooms in their own yards. The neighbor’s complaint turned out to be a blessing in disguise, an important step in this social movement to live collectively and lightly on our planet. In the meantime, the occupy movement arose, with hundreds of people in Eugene sleeping in a nomadic village that moved from street corners to parks and back. Many were homeless folks who came out of their cars and hiding spots in bushes to gather with activists taking a break from their homes, and through this process, consciousness rose in the city around the issue of homelessness. After the occupiers dispersed, the issue of homelessness remained alive, and city council meetings became packed with people expressing a desire to address the problem. The city council approved the creation of Opportunity Village and several other related initiatives. People attended fundraising events with music and delicious meals and offered money and supplies for building conestoga huts. Churches allowed homeless people to stay in conestoga huts placed on their properties while folks were waiting for Opportunity Village to be approved and built. And this isn’t the end of the story. There’s a movement afoot to create more places like Opportunity Village in Eugene, as well as a village of tiny houses where people can live permanently. Other locales are citing the successful operation of Opportunity Village as they lobby for similar initiatives in their towns. I’ve sometimes heard people arguing about what activist roles are most important, with some people declaring other people to be slackers, inflammatory, delusional, or enemies. Yet in the same way that our gardens rely on different plants to host beneficial insects, synthesize nitrogen, and prevent erosion, our movements rely on a wide assortment of contributors. Our wisest social transformation guides are pointing to a different perspective that deemphasizes a sense of separation and judgment towards others. There is a need, they say, for those who take to the streets, for supportive public officials, for journalists, for artists and inventors, and for visionary edge-walkers and their followers. Musicians, cooks, facilitators, graphic artists, and conscious law-breakers also play their parts. There is room for those who oppose our ideas, for in responding to their concerns we become stronger, just as wind and drought can help plants grow deep roots. Our power to transform the world multiplies when each of us collaboratively contributes that which is at the intersection of our gifts, our passions, and what the world needs. Melanie Rios is an urban gardener, musician, and intentional community consultant who lives in Portland, Oregon. One of her current passions is creating terra preta soil to sequester carbon, increase garden fertility, and establish a healthy sanitation system. She recently founded the Village Singers, a choir that leads work-party volunteers in singing harmony while they create gardens and cob structures. Melanie offers workshops and coaching in sociocracy, social permaculture, conflict resolution, culture shift, composting, and other resiliency-promoting topics. Dome Villagers say what they value most about their home is their relationships with their fellow villagers, and they seem to have created a culture where people contribute generously to each other. “Whenever someone needs help, I offer,” says Jesse, “and folks help me when I have a need, whether it’s to build a dome or bring in firewood.” On one recent evening, a few people traded massages on top of sleeping bags rolled out in front of the stove. Coral said she was hungry for calzones, and Rafael offered to cook enough for everyone… A neighbor came by to ask if anyone wanted to help make a brochure informing our urban neighborhood about a “city repair” project he’s organizing, and John volunteered. Later, a visiting traveler from Germany started playing some upbeat music, and some folks started dancing. —Quoted from “Alternative America” by Melanie Rios, Permaculture Magazine: Solutions for Sustainable Living, Issue #56, Summer 2008. ● Consider the law you wish to change. What is its intended purpose? What needs and values does the law support? What consequences of this law are a problem, and for whom? ● Consider solutions to these problematic consequences that still support the intended consequences of the law, assuming you support those intentions. ● Experiment with implementing these solutions, even if it means breaking the law. Keep refining your experiment to decrease what isn’t yet working well. ● Document how and why you’re conducting this experiment, and tell this story in person, in print, using social media, and through creative expression such as songs and theater. ● Support people who are creatively and productively breaking problematic laws by testifying at hearings and contributing resources. ● See the good in everyone, as this brings out the best in them. ● Nurture those who are on the front lines with food, friendship, and shelter. ● Take to the streets with signs and leaflets. ● Support change from within institutions. ● Listen deeply to those who disagree with you, and look for ways that their ideas can improve your work.